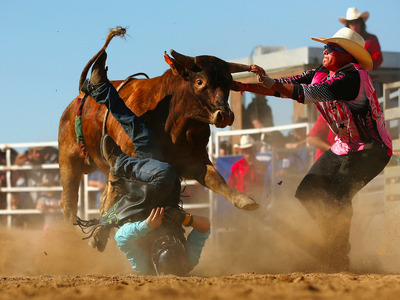 Mark Kolbe/Getty ImagesWalmart is bringing live bulls to stores. Walmart is bringing live bulls and professional bull riders to its stores this year. The animals are part of a “retail-tainment” strategy aimed at driving traffic to physical stores and getting a leg up over its online-only rival, Amazon, Fortune’s Phil Wahba reports. The bulls will visit 40 of Walmart’s US stores this year and another 200 next year, Wahba reports. They were already featured at three stores this year and the events were a hit, drawing long lines of customers, according to AdAge. There’s no actual bull-riding at the events, but the professional riders sign autographs and the bulls are brought into the parking lots on tractor-trailers. Walmart Chief Marketing Officer Tony Rogers says company research shows consumers want more in-store events. Walmart is trying to drive traffic to its stores because that’s where the company makes most of its money. The company’s revenue last year was $485.7 billion, and online sales accounted for just $13.7 billion of that.